(Jan 16): Southeast Asian stock markets ended lower on Monday, as investors turned jittery over concerns Britain faces a "hard" exit from the European Union, sending the pound to its lowest levels — bar a "flash crash" in October — in 32 years. The sterling plunged to as low as US$1.1983 in early trade in Asia, depths not seen since a bout of thin liquidity triggered a "flash crash" on Oct 7 that wiped as much as 10% off the pound in a matter of minutes. The sterling, which fell as much as 1.5% against the dollar and over 2% against the yen, was down 0.9% at US$1.2070 as of 0957 GMT. U.K. Prime Minister Theresa May will use a speech on Tuesday, to signal plans for a "hard Brexit", quitting the EU's single market to regain control of Britain's borders, the Sunday Times reported. Investors have been worried such a decisive break from the single market would hurt British exports and drive foreign investment out of the country. "Most of the regional markets are down today, after the British pound weakened, as its prime minister is seeking a hard Brexit," said Manny Cruz, an analyst with Manila-based Asiasec Equities Inc.
Singapore's FTSE Straits Times Index ended 0.4% lower, dragged down by consumer stocks. Singapore Press Holdings Ltd lost 3.5%, while Wilmar International Ltd closed 0.8% lower. Vietnam shares ended 1% lower, posting losses for a third consecutive session, dragged down by financials and energy stocks. 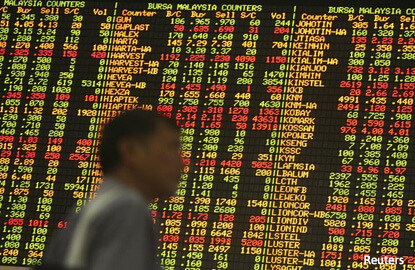 Malaysia ended down 0.8%, pulled lower by financials and industrials. Malayan Banking Bhd, the biggest loser on the index, fell 3.3%. Philippines erased early gains to end marginally lower, with higher financials offsetting losses in industrials. "I think we ended in negative territory, as the negative sentiment in the region spilled over to the local market," said Cruz of Asiasec Equities.